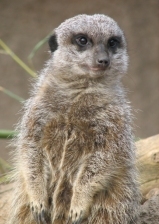 The Meerkat is a small mammal that is part of the mongoose family. Meerkats were made famous with the TV show Meerkat Manor from Animal Planet that followed several Meerkat families in the Kalahari Desert. The scientific name for Meerkat is suricata suricatta. Meerkats live in the African Kalahari desert in the countries of South Africa and Botswana. They dig large networks of underground tunnels where they stay during the night. These tunnels have multiple openings for escaping a predator. Do Meerkats live in a group? Yes, they live in large family groups called clans, mobs, or gangs. The number of meerkats in a clan can vary in size. They typically have around 20 members, but sometimes grow to as many as 50 members. The clan works together to help each other out. One or two meerkats will look out for predators while others scavenge for food. If the lookouts spot a predator they will give a warning bark and the rest of the family will quickly escape into the underground burrow. In each clan there is an alpha pair of meerkats that lead the group. The alpha pair typically reserves the right to mate and produce offspring. If others in the clan reproduce, then the alpha pair will usually kill the young and may kick the mother out of the clan. Each meerkat mob will have a territory which they mark off with their scent. It is usually around four square miles. They won't allow another group or mob of meerkats into their territory and will fight them, if needed. They move around within the territory each day in order to forage for food in different spots. Meerkats are omnivores, meaning they eat both plants and animals. They mostly eat insects, but they will also eat lizards, snakes, eggs, and fruit. They can even eat some poisonous prey like scorpions as they are immune to their poison. Since they don't have a lot of body fat, meerkats need to eat every day to keep their energy up. Why do they stand up so straight? Generally the sentry, or lookout, will stand up straight on its hind legs using its tail to balance. This is so that it can get as high as possible to look for predators. Predators of the meerkat include snakes, jackals, and birds of prey. The burrows that they dig are good for protection, but they also help them to keep cool from the hot desert sun. Their tan and brown fur helps them to blend into the desert and hide from predators such as eagles. If the group feels threatened by a predator, they will sometimes try mobbing or attacking it in a group. Although they usually run, they can be fierce fighters when needed. Timon from the Disney movie The Lion King was a meerkat. The entire family including the father and siblings will help to take care of newborn meerkats. They are considered a type of mongoose.